Teeth whitening has become one of the most sought-after cosmetic dentistry services. Not only does this treatment quickly brighten your smile, but it is non-invasive and can be completed in one office visit or from the comfort of your home. At Martinez Dental Solutions we are excited about the patented GLO® technology for the most dramatic teeth whitening results with little to no sensitivity (no “zingers!”). We offer both in-office and take-home GLO® teeth whitening options. 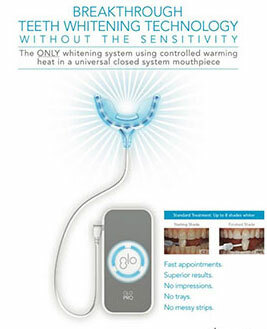 GLO® is the ONLY whitening system using controlled warming heat in a universal closed system mouthpiece. The Patented GLO® mouthpiece combines LED light and heat resistors in a closed system, which prevents oxygens from escaping the teeth. With each application, the mouthpiece warms up to the optimal temperature to accelerate and activate the process for quicker, more efficient results. Also, the patented GLO® Whitening G-Vial has a unique brush tip that allows for a precise application, targeting the teeth. The uniquely formulated gel does not migrate onto the soft tissue and gums, preventing sensitivity. The G-Vial is hermetically sealed, keeping the gel fresh until opened. The first step involves coming in for an evaluation and cleaning. We will check to see if you have any existing fillings, crowns, caps, or veneers as only natural tooth enamel will whiten. If you have existing composite restorations, they may need to be replaced to ensure a good match with your newly whitened teeth. Once we have determined that you are a suitable candidate for in-office teeth whitening, you will need to have your teeth cleaned and polished to remove all plaque before performing the teeth whitening. The in-office GLO® teeth-whitening appointment will last about an hour and will consist of three to four 8-minute applications, at the end of which, your teeth will be up to 8 shades lighter. If you have existing composite restorations, after your whitening appointment, you may need to return for restoration replacements as mentioned earlier. You can achieve dramatic teeth whitening results at home with your own GLO® Professional device. At our office, you can purchase a kit that includes the same warming GLO® mouthpiece technology we use in the dental office, along with 10 whitening gel G-Vials for ten days of professional whitening at home. You can use the kit for five-day, complete whitening treatments or for monthly one-day touch ups so you can maintain your whitest smile all year long! Keep extra G-Vial refills on hand so you can whiten any time you need to. 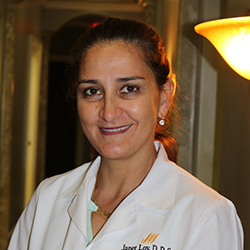 Martinez Dental Solutions is ready to help you achieve a more dazzling smile!